Wesley Chalfant, devoted and loving husband, father, grandfather and great-grandfather passed away at the age of 90 on July 15, 2017 at his home in Midland, Texas. Born March 19, 1927 in Cheyenne, Oklahoma to William and Loura Chalfant, Wesley was the third of four children. He spent his childhood in Cheyenne and then went on to serve in the United States Army Air Corps. After serving he went to the University of Oklahoma to earn his law degree. OU is where he met the love of his life, Doris Fern Chalfant, with whom he celebrated nearly 67 years of wedded bliss. After college, Wesley entered into the oil and gas industry as a scout for Lion Oil Company. He then went on to be a landman and briefly lived in Bismarck, North Dakota and Denver, Colorado. 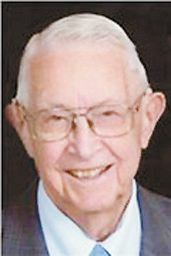 He made his way to Midland in 1958 and co-founded Chalfant, Magee and Hansen and stayed very involved in his business and the industry until his passing. Wesley was active in the Permian Basin Landman Association and is well-remembered for mentoring and teaching young landmen. He was also active in the Exchange Club of Midland. Wesley was a faithful and devoted servant to the Lord. He was a member of First Presbyterian Church of Midland for nearly 60 years and was also a member of First Presbyterian Church of Ruidoso. At First Presbyterian of Midland he taught Sunday School and served as a Deacon and an Elder. Every Sunday, Wesley and Doris could be found in the same row at church and they never missed the annual Christmas Round The Table Carol Sing. He also enjoyed giving back to his community through volunteerism. He spent many hours tutoring children at CASA and volunteering for Hospice of Midland. For most of his life Wesley was an avid golfer and later picked up wood carving. Wesley always looked forward to his and Doris’ weekly Tuesday night supper club at Midland County Club. He will be remembered for his humble and thankful spirit. He valued God and his family above all else. Lovingly referred to as “Papa” by his grandchildren and great-grandchildren, he enjoyed sitting on the ground and playing games with all of them. His favorite and most beloved game was pulling quarters out of his great-grandchildren’s ears. Wesley especially cherished the memories he and his family made vacationing in Ruidoso, where they spent every summer for nearly 50 years. Wesley is survived by his wife, Doris Fern Chalfant; his son William Chalfant (Katherine); and his daughters, Susan O’Brien (Mike) and Emily Ware; his grandchildren Paul Chalfant, Matthew Chalfant (Amber), Leslie Ortloff (Clayton), Andrew Lawson, Alicia Hudson (Seth), Melissa Johnson (Trevor) and Wesley Ware (Jenny); and his nine great-grandchildren who he absolutely adored. Serving as honorary pallbearers are Matthew Chalfant, Paul Chalfant, Hyle Doss, Robert Frazier, Seth Hudson, Trevor Johnson, Andrew Lawson, Clayton Ortloff and Wesley Ware. The memorial service will be held at 1:00 pm, Wednesday, July 19, 2017 at First Presbyterian Church of Midland, 800 W. Texas Avenue, where the Senior Pastor Steve Schorr will officiate. In lieu of flowers, contributions in memory of Mr. Wesley Chalfant may be directed to Hospice Midland, 911 West Texas Avenue, Midland, TX 79701 or First Presbyterian Church of Midland.